Break away from your 6 and 8 count patterns and up your connection game by learning the pattern-less phenomenon that is groove walking. Explore new ways to step with the music and develop a more nuanced sense of connection. Learn advanced walking techniques to shuffle, cross-over, and desynchronize your steps. 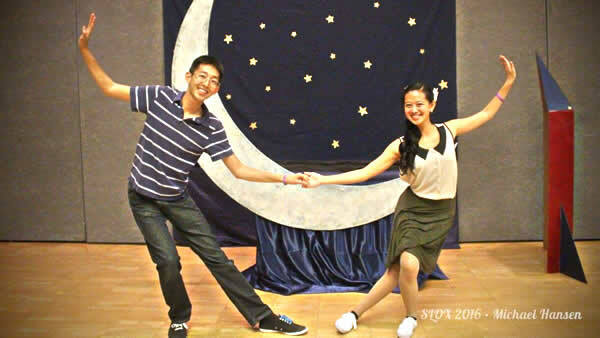 Sam and Calvin fell in love with swing dancing at UC Berkeley’s Lindy on Sproul and SwingCal, both becoming active members of the swing community by teaching, mentoring, and DJing. Raised in Cal’s ambidancetrous community, you’ll often find them both leading and following on the social dance floor. Their dancing focuses on playful partnership and lighthearted silliness. Coming from performances with the Sproul Stompers and recent competition experience, Sam and Calvin are excited to share their enthusiasm at Cat’s Corner! Check out their moves in the 2016 Swingin’ at the Savoy History of Lindy Hop Strictly Competition. 3-week series cost: $45 early registration by Jan 2nd. $50 online after the deadline. $55 at the door. Drop-in cost: $20 per week with teacher permission. Sign up online today and save your spot in class!